It is surprising that such an old and relatively important mill is generally under-the-radar. My bet is that the owner would rather hang on to the property as long as possible – perhaps it has been in their family for quite some time – rather than redevelop the mill into more-finished office space or even residential. The Benny’s sign from the highway os one of the more recognizable advertisements along the Providence stretch of I-95. 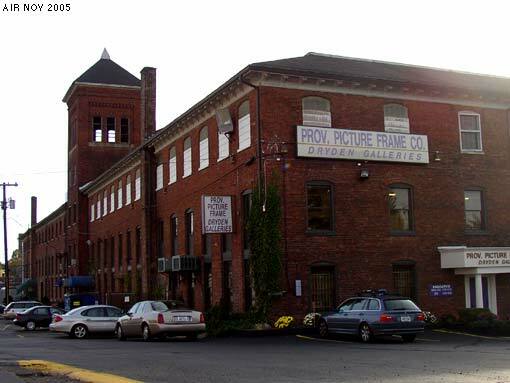 As long as I have been here – since 1999 – this building has been home to the Providence Picture Frame Company and Dryen Galleries. There is also some office space in the back. According to some of the anecdotes left below, the Providence Picture Frame company may be even older than the building, circa 1830. The Allen Printworks, more than any other printing establishment in Providence, was a vital force in the textile and cloth-printing industry. Founded in 1830 by Phillip Allen – an engineer, inventor, governor and state senator – the Phillip Allen and Sons Company originally printed cloth by hand with carved blocks, but as early as 1835 Allen introduced printing machines to his establishment which greatly increased the speed of calico production. By 1846 Phillip Allen and Sons had five printing machines and employed 250 workers who turned out 130,000 yards of calico cloth a week. By 1849 the printworks had one main mill and six ancillary structures surrounding it. When the panic of 1857 swept the country, however, Phillip Allen and Sons was one of the many firms forced to declare bankruptcy. The printworks, which had tripled in size since 1849, were bought by Phillip Allen’s brother Crawford and were reorganized as the Woonsocket Company. Crawford Allen, who had been involved in the printworks and cotton industry in Valley Falls and in Pawtucket, managed the business aspect of the operation, while Zachariah Allen, the middle and most famous Allen brother, managed the plant itself. Zachariah Allen was well known for his contributions to steam-engine and textile-machine technology. In 1870 Crawford Allen retired from active management, and in 1871 the company was reorganized under the control of Allen’s lawyers as the Allen printworks. Zachariah also retired, and the newly organized printworks failed, however, in 1879 the works were reorganized and put back into operation by the company’s main stockholders. One of the main buildings left from this complex is the main mill, a three-story brick structure with a five-story central tower and a jerkinhead-gable roof. The northern part of the mill was rebuilt in 1874 after a fire and incorporated part of an earlier stone mill. The section south of the tower was built in 1871. To the east of the main mill is a small two-story, stone and brick structure with a trapdoor monitor roof. This building is the oldest on the site and may be the original stone structure built by Phillip Allen in 1830. Elayne Clay Oct 7 2015 I have two silloutte prints?... small in size framed in black frames with the sticker on the back "The Arcade Art Store" Providence R.I. anyone know anything about these? Ray McKenna Jan 20 2014 I am researching the early generations of Irish immigrants to Providence. I am particularly interested in the period from the 1820s to the 1870s. If anyone has stories, documents or photos that they care to share, it will help put this history together for all of us. melissa Aug 2 2013 I know where a picture is that was framed at the Arcade Art Store and is in a hand carved frame with A picture that says 1918 Sahel Curtis 40221 ~ Does anyone know about this? Loree Muldowney Aug 8 2010 My Irish immigrant ancestors arrived in Providence in the late 1840s and found jobs at Allen’s printworks. Until the mid-1850’s, maybe till the panic and bankruptcy situation in 1857, five brothers were employed by Allen... Alexander, John, Barney, William, Michael and Patrick Doyle. They all lived in the North Main street area. Alex went on to have a grocery store on Sexton Street. Barney, Michael and Patrick had liquor stores on North Main. C. Rodziewicz July 23 2008 Last year a friend gave me a embroidered work framed by the Providence Picture Frame Co. The sticker on the back had a six-pillared classical building with 1828 centered above the PPF Co. name and tag line “The Arcade Art Store.” then, 3rd floor Arcade Bldg. Would someone know when this sticker stopped being used? It would help me date the embroidery. Dave Biggs One of my Great, Great Grandfathers worked for the Providence Picture Frame Company for 40 years. He arrived in Providence from Derbyshire, England in 1864 and lived out his life there with wife and children. His name was William Arthur Camp 1834 - 1911. His sons, who became plumbers in Providence, built two family homes around 1900 on Dora Street in the city. One of them remains in our family and is occupied by a decendant. I don’t know how long the Providence Picture Frame Company has been in the building you have documented here, but I know the company was founded in the early 1800’s and has only had three owners in all that time.